Shouldn’t the OnomontoPOWia read KROTCH instead of KROK? I believe in the original it didnt have the R in it. 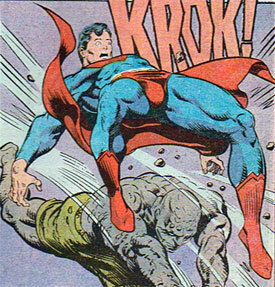 I don’t know if the problem here is the crotch shot or Supe’s suddenly withered right leg. Bad foreshortening! Bad, bad! I agree John. I just looked at his leg and it seems to have shrunk quite a bit.